Very few people today know anyone who was involved in World War I. 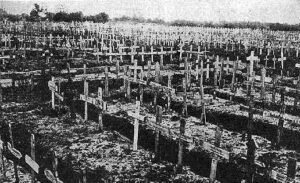 Fewer still have heard of the French hamlet of Romagne-sous-Montfaucon, rarely mentioned by name in headlines in a season in which the recapture of St. Quentin and Cambrai were momentous breaks in trench warfare and in which the battles for Belleau Wood and St. Mihiel were almost exclusively American shows. Romagne was only a few miles from where Joan of Arc grew up, remote from Verdun and Rheims, the focal points of strategic battles. However, for Americans, Romagne was the center of World War I. In 1918, over one million, two hundred thousand American troops took part in the largest military campaign in American history, the Meuse – Argonne offensive. In a country in which thousands of citizens still remembered the crushing deaths of the Civil War, almost every single person in the United States knew someone who fought in the Meuse –Argonne offensive. It continued until the very minute that the guns went silent on November 11. Wartime France was six hours ahead of New York, seven ahead of the Central Time Zone, so the declaration of an armistice to commence at eleven a.m. on November 11 arrived in the middle of the night, in time for the morning newspapers: Armistice Signed, Victory Won, War is Over, Germany Quits, Austin American Office 4:00 a.m. It is that event that became Armistice Day, now Veterans’ Day and, in Canada and the UK, Remembrance Day. The November 11 headlines were a relief but not a surprise. Every newspaper in the United States had predicted victory as Germans retreated and its allies, Bulgaria and Turkey, capitulated. News stories in October and early November reported that the Kaiser had abdicated, that Austria-Hungary pleaded for armistice after its losses in Italy, and that allied armies had broken out of Flanders and were pushing past Ghent toward Brussels. By November, 1918, every American knew the war would end soon, and favorably. Even so, the Armistice of November 11 may not have been the most important story of the day. 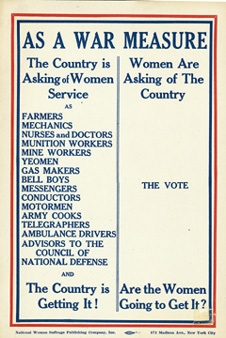 On October 2, 1918, a secondary headline announced that ‘Woman suffrage meets its defeat by vote in the senate of 54 to 30.’ An enlightened Texas legislature went its own way and granted universal suffrage, with the extra provision that women who did not vote were not obligated to pay a poll tax, unlike men who had to pay whether they voted or not. Other American women were not so blessed. Congress would not pass the Nineteenth Amendment for universal suffrage until June, 1919, the same month that the Treaty of Versailles was signed to officially end World War I. 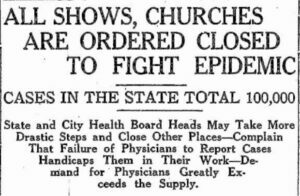 An even more devastating story began to surface in September, 1918, when a small column announced that ‘Spanish influenza arrives in US.’ On October 1, some 14,000 cases of Spanish influenza had been diagnosed in American military camps in the United States. By October 8, 1918, more than 167,000 cases had been reported and an urgent call was made for all nurses to report for medical assistance duty. By November 10 it was reported that there were over 200,000 deaths in the United States in October, 1918, more than in any month in history. In Austin, Texas alone some 261 people died, along with the daughter of the abdicated Kaiser, Spanish King Alfonso XIII,’ and assorted legislators, congressmen, and judges. Life expectancy rates plummeted by a dozen years as one of every five Americans became ill. 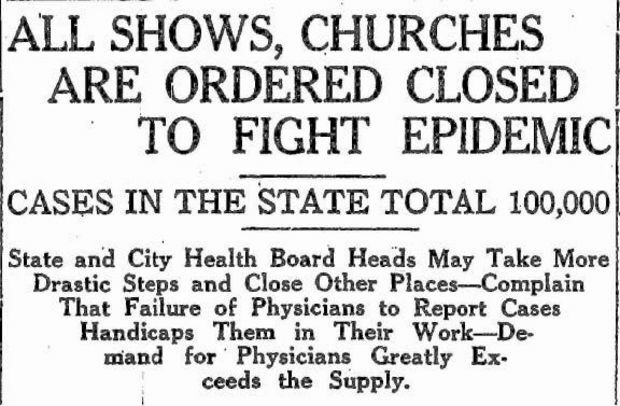 The flu ended almost as quickly as the war. By December, 1918, deaths had dropped. By Summer, 1919, it was gone. Still, it is to World War I that we owe November 11. By that date, more Americans had died in the vicinity of Romagne than on any other field in history. In only six weeks 26,277 Americans died there, more than in Gettysburg, the invasion of Normandy in 1944, or the 1968 Tet Offensive in Vietnam. Decades before the discovery and use of penicillin to treat wounds and the jeep to take the wounded to field hospitals, medics saw more men die from infections days after they were wounded than from the wounds themselves. 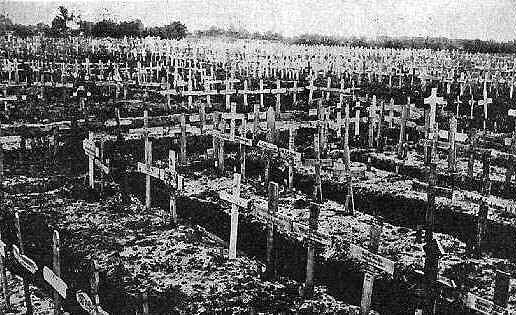 Most casualties of the Meuse-Argonne offensive are still there, in Romagne, France. The Meuse – Argonne American military cemetery is the honored resting place of 14,246 young men, more than the World War II cemeteries in Normandy at Colleville-sur-Mer and at Rome-Sicily in Italy. Still off the main roads, it is the largest, but least-visited, American cemetery in Europe. You may not know anyone who is buried there, or anyone who died of Spanish influenza or from the battles over things as basic as the right to vote. But those who went before us did, and made us a better nation for it. Remember them on November 11. Jack Woodville London is the 2011-2012 Military Writers Society of America Author of the Year and a member of the Award Planning Committee of the Center for Fiction, NYC. He lives in Austin with his wife, Alice, and writing cat, JuneBug. His uncle is buried in the Meuse-Argonne American Military Cemetery. His father’s parents both died of the Spanish influenza. ← Thank you very much indeed….